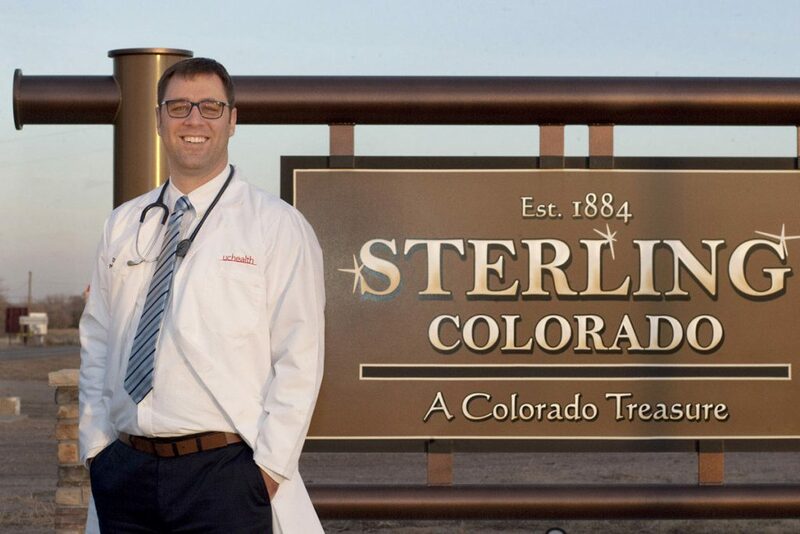 Sterling’s new physician, Dr. Daniel Lambrecht, has returned to his hometown roots. Photos by Joel Blocker, for UCHealth. If you’re going to practice medicine in a small town, why not make it your home town? That’s the philosophy of Dr. Daniel Lambrecht, an internal medicine and pediatrics specialist who recently returned to his hometown of Sterling, in northeastern Colorado. Lambrecht, who is now on staff at the UCHealth Primary Care Clinic – Sterling, is happy to be home and among family. His parents are from the area and he’s lived there since he was 3 years old. His wife, whom he has known since kindergarten, also is from Sterling. “It just made sense that one day I would return here. We have grandparents and other relatives involved in our lives – and lots of babysitters,” he said, laughing. He didn’t always want to be a doctor. “When I was little, I wanted to be an astronaut like everybody else. Then, in high school I got into this program, a club you could join, and did respiratory therapy at the hospital. I was immediately hooked on the interaction with the patients. Ever since then, I knew that was the route I would go,” he said. He also knew he’d come back home someday. “When I started down the path to medicine, more than a decade ago, I always knew I would be returning to serve the community I grew up in,” he said. 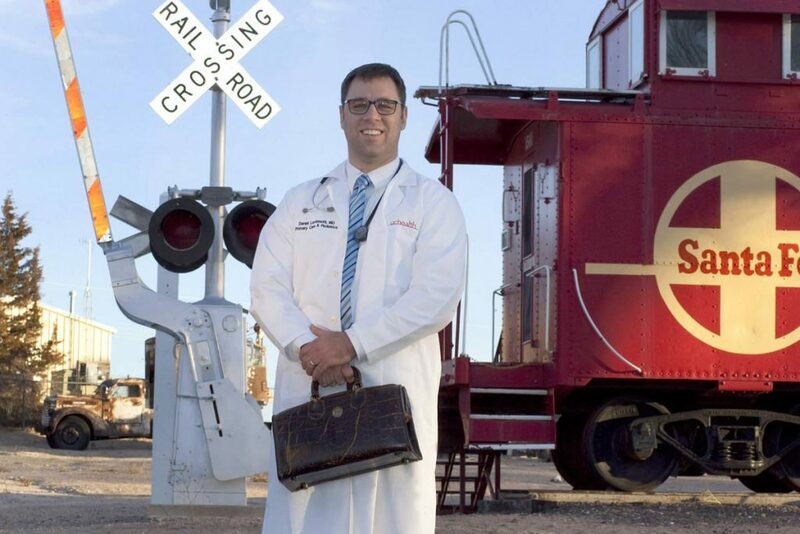 Dr. Daniel Lambrecht, a primary care doctor for UCHealth in Sterling, Colorado, at the Overland Trail Museum in Sterling. He earned his undergraduate and graduate degrees at Creighton University. “Creighton has a reputation for being good preparation for medical school,” Lambrecht said. His wife also went there, training to be a nurse practitioner, until their children came along. He went to medical school at the University of Missouri Medical School, and he decided to do a dual certification – in internal medicine and pediatrics. “My decision to pursue this four-year residency was founded on the desire to care for all members of my community, from birth to geriatrics,” he said. The combination isn’t that unusual in some parts of the country, but it is somewhat unusual in the Midwest and West. “Having grown up here, there was never a pediatrician in town when I was a kid. I wanted to provide that specific service,” he said. The internal medicine part of his training allows him interaction with not only adults, but kids who need a little extra care. That includes kids who are born prematurely or who develop serious childhood diseases, such as cystic fibrosis or juvenile diabetes. “That way, families don’t have to go out to town to get special help,” he reasoned. Another area of interest for him is weight management. 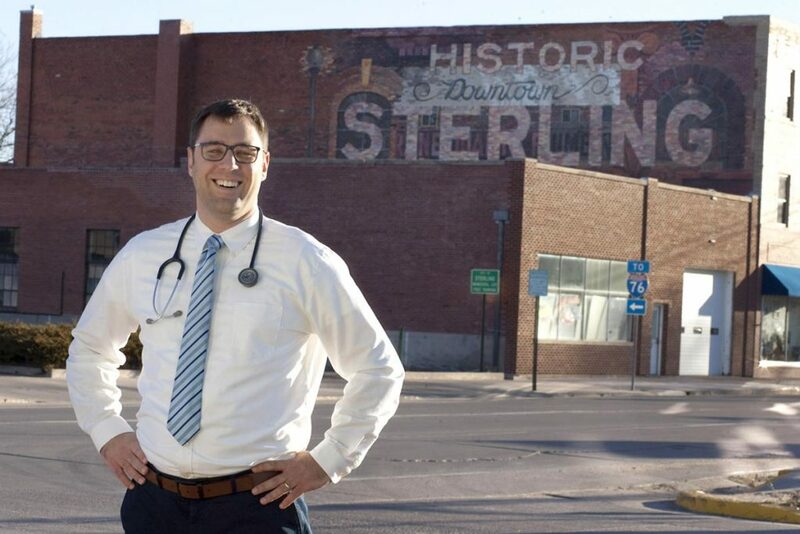 Dr. Daniel Lambrecht, a primary care doctor for UCHealth in Sterling, Colorado, poses on the corner of North Fourth Street in Sterling’s historic downtown. Overweight children can develop diseases, such as diabetes, as early as ages 10 or 12, he added. “This is a disease more commonly cared for by doctors who treat adults, not children. I can do both. We talk about it at every well-child check-up,” he said. And those aren’t the only questions, he said, that need to be asked. One reason he joined the UCHealth team is because they resources are available to help address those issues. For example, he has access to a clinical psychologist on staff. Asking questions is the first step to providing excellent health care, he believes. “You need to immerse yourself in the community before you start acting like you know what’s good for everybody, to try to find out what (services) local folks think are needed,” he said. One of the unexpectedly wonderful aspects about returning to Sterling, he said, is working side by side with doctors he knew as a child. He thinks he made the right decision, returning to Sterling. “I love it here. I can’t tell you how many times I walk into a room and the patient knows me or my family. There’s a little bit of a deeper connection instantly. I can’t tell you know cool that is,” he said. Some physicians come to small towns to start a practice, but often don’t stay for long, he said. They move on to larger towns or cities. Lambrecht, however, says he’s in Sterling for good. It’s home. Linda DuVal is a freelance writer based in Colorado Springs who writes articles for UCHealth.